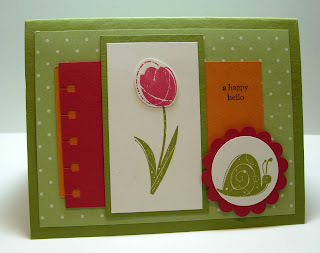 I was pleasantly surprised to find another one of my cards appear on Stamper's Showcase this morning! You can see all the details about this card HERE on my original post. Thanks Kriss and Phyllis for the heads up! Last night was our monthly weSTAMP meeting and swap. 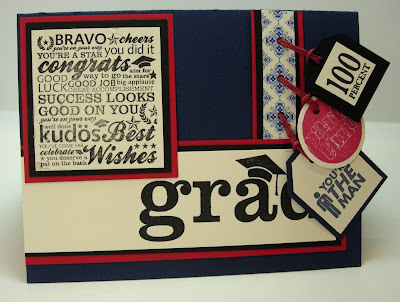 In case you're new to my blog, weSTAMP is a group of Stampin' Up! Demonstrators from Lorri Heiling's and my creative teams. We meet once a month for training, fellowship, and swapping! This first card is the Make 'n Take provided by Adriana Gray using the stamp set, Life's a Breeze and the Something Fishy Jumbo Wheel. Isn't it awesome?! We also used Stickles on the three beach images for some sparkle! Each month, we have a different "theme" for our swap cards. 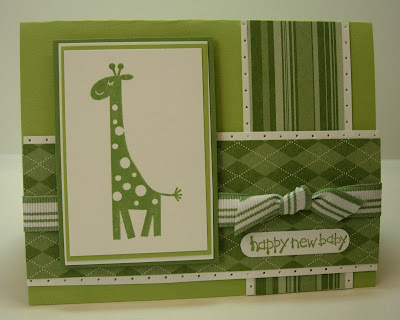 This month, we followed the Splitcoaststampers Sketch Challenge #126. In my previous post tonight, I closed by saying that I was going off to bed. 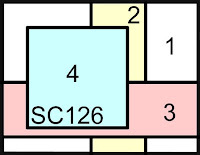 I made the mistake of checking to see if the Featured Stamper (FS68) on SCS had been posted yet. Well ... one thing led to another and just had to case one of Peanutbee's cards from her beautiful gallery! 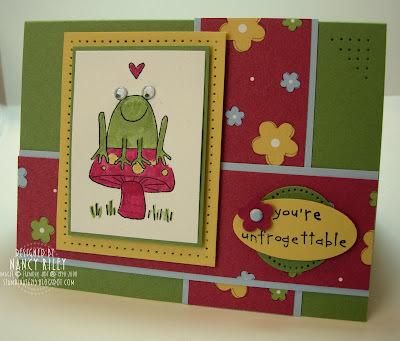 I was thrilled to find THIS CARD by Peanutbee using the stamp set, So Much. I've had this set for weeks, and hadn't used it yet. I've been a bad blogger this week. It's just been busy with the kids finishing up the school year, coordinating summer plans, graduations, etc. What little stamping time I've had has been spent designing cards for three different swaps, then mass assembling them. I got two of them mailed out today, and am finishing up the third swap cards within the next couple of days. I can't wait to show them to you, but want to wait until the swappers see them first! Some of the challenges with lots of layers are difficult to make a 5 1/2" x 4 1/4" card. Do you ever make a 5" x 7"? I can't say that I've ever made a 5" x 7" card, but do frequently make the 5 1/4" square. Other than Splitcoast, which forums do you visit? None really ... Splitcoast and MANY other blogs are my source of inspiration. In case you've never visited Splitcoaststampers, you can find it HERE. What is one of your favorite blogs that you visit for inspiration? I couldn't possibly choose ONE favorite blog for inspiration! 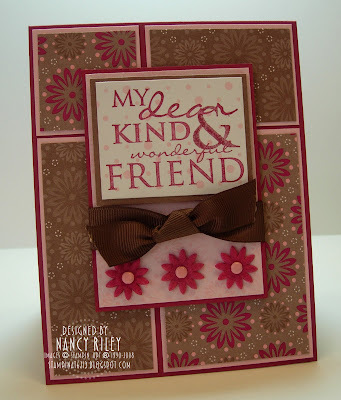 There are so many fantastic bloggers/stampers out there, and my favorites are on my sidebar. Check them out! Who got you interested in stamping? I'm not really sure WHO, but I did attend a Stampin' Up! demonstration with a friend back in the 90's when I was heavy into scrapbooking and had absolutely NO interest in stamping ... thought the demonstration I attended was a complete waste of my time! I know ... can you believe it?! (btw .. I used to be a Creative Memories Consultant and taught scrapbooking classes!). I remember how awkward the stamps were in my hands, and couldn't figure out what all the fuss was about among all the other participants! Anyway, years later, I decided that I'd like to give stamping another try, and had a friend who stamped. I told her that if she ever had another stamp party, I wanted to be sure to be there. The rest is history! 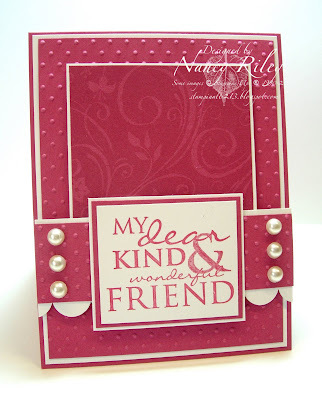 What do you find most exciting about stamping? So many things! ... 1) The stuff! I've always loved paper, craft items, and do-dads. (I can't go to Walmart or Target without going down the office supply aisle!). 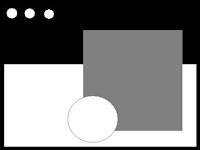 Stamping supplies fulfill that need!, 2) You can see an end result in a short amount of time. For me, that's why I get frustrated with scrapbooking because I think there's no end to all the photographs that need put into albums. With stamping, a card can be made in a matter of minutes!, 3) The cards and projects I've made for others (and have offered as projects at my classes) bring alot of joy to people. A handmade card is so much more personal than a store bought card!, 4) the obvious ... it allows me to be creative! How do you store/reuse your paper scraps? See my system for storing and reusing paper scraps HERE, along with storage for 8 1/2" x 11" Cardstock and 12" x 12" Designer Papers. What product(s) would you most like to see come in August in the new catalog? Die-Cut Stamp Sets! I'm crossing my fingers! I'm always up for new Designer Papers and Embellishments too! I'm horrible at cutting, it seems I never get things straight. Any tricks you can share? Yes, Stampin' Up! 's Tabletop Paper Cutter! Couldn't live without that wonderful tool ... straight cuts every time! I'm a beginner - when do you get over the fear of stamping and start enjoying it? I feel I will mess everything up. Remember, it's just paper! If you do mess up, just re-do! Practice makes perfect! I really do believe that the more your hands are familiar with the tools and mediums, the more skilled you will be with them. From where do you get your ideas? Are you just a naturally wonderfully creative person? This question is so funny to me, as I really don't consider myself "creative". Growing up on the farm, IF I did have any creativity in me as a child, it certainly wasn't nurtured! Creative people were "city people"! I don't think I did a single creative thing until finding scrapbooking in my 30's! Still, to this day, I don't consider myself "creative" and am rarely satisfied with my own creations! 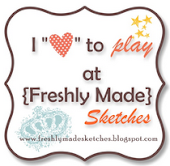 I'm a very visual learner, and spend alot of time looking at other stampers' creations ... I'm simply copying what they're doing with my twist to it! Do you have any tips on how to organize all the stamps and supplies? Yes, please see THESE POSTS showing how I organize my stamps and supplies in my studio (or go to Labels on my Sidebar ... check out "ORGANIZATION"). I've been thinking of purchasing the Stampin' Up! Scallop Punch. I have the Marvy yellow and blue scallop punch. Is the Stampin' Up! Scallop Punch size in between these two punch sizes? I don't know anything about the Marvy punches, but can tell you that the Stampin' Up! Scallop Punch is 1 3/4" in diameter ... AND I couldn't live without it! What helps you get in "the mood" to stamp on days you don't feel like it? Sorry, but I'm ALWAYS in the mood for stamping ... no problems there! Any chance you will move to Seattle as my neighbor? Is the economy better in Seattle than it is in Phoenix? LOL! Any chance of you coming to Colorado for demonstrations? If anyone would like to foot the bill for that business trip, I'd definitely consider it! It would be fun to take this stampin' gig out on the road! How many stamp sets do you own? Gol' ... I just did a quick count and came up with approximately 170 sets, including background stamps. MANY are retired. I've also sold MANY retired stamp sets in the six years I've been stamping! What is your favorite technique? I'm not much of a technique style stamper. I guess what I mean by that is ... embossing and glitter are probably my least favorite things to work with ... they are so messy and I only do them if I have to! I prefer non-messy techniques, and paper piercing is probably the technique I use the most. It's very easy and adds so much to a design! What stamp set do you reach for most often? That varies, but lately I've been reaching for Tart & Tangy and Enjoy Every Moment most often. With two busy kids, how much time do you get to stamp each week? That varies too. Some weeks I get almost NO time to stamp (like this week). Other weeks I can really close the door to my studio and crank out some designs, swap cards, and class projects. The challenges on Splitcoast and other blogs are so addictive, and I wish I had time to do every single one of them! Do you have a stamping purchase that you have regretted later? Yes, I purchased several of the SU retired large monogram stamps when they first came out, and never used a single one of them. I still have the "N" and the "R", and they look really cool standing up on top of my stamp shelf as decor in my studio! I'll be back another day to answer more of the great questions readers left for me! I cleaned out closets most of the day and am pooped! Off to bed ... thanks for stopping by! I don't know what it is about me and baby boy cards lately. I really only know about a couple of women expecting right now. I don't think I even owned a baby themed stamp set until recently! Makin' up for lost time, I guess?! 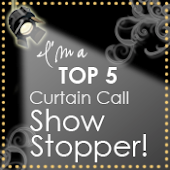 Today's SCS Featured Stamper (FS67) is Dawn McVey, Dawnsing on SCS. You can find Dawn's SCS gallery HERE, and her blog, My Favorite Things HERE. Both are FILLED with cards showing her unique, creative, clean-cut style! THIS is Dawn's card I chose to case. The things I changed in my case include: a) color scheme from Real Red and Whisper White to Bashful Blue and Whisper White, b) different stamps/rub-ons/sentiments, and c) my scallop medallion has a few more layers and dimension, along with paper piercing on each scallop. Both the stamp set, In The Stars, and the Rub-Ons, A Perfect Day, can be found in the Occasions Mini Collection, which has been extended to June 30 !!! .... extra time to order more must-haves from this collection! DEMONSTRATOR STARTER KIT 20% OFF + FREE HPH ! * I'm not a Demonstrator but I know enough to be one. * I love all the Stampin' Up! products but I'm not a demo. * I hope to become a SU Demo one day. * I would love to be a "real stamper" someday. * I am not a demo but have been thinking about it. * I am not a demonstrator but I have toyed with the idea. * I am not a demo, but admire all the gals that are demos! 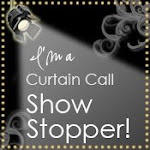 * I would have saved alot of money if I were a Stampin' Up! Demonstrator! * I'm not a SU Demo, but I've come close several times. * I am not a Demonstrator, but am considering it for the future. 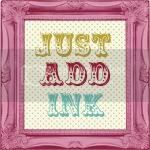 * I am not a Demonstrator, but have thought about it just to support my addiction to stamping. * I'm not a Stampin' Up! Demonstrator although people keep telling me I should become one so I could take advantage of the perks! * I would like to be a Demonstrator one day. ...without saying, "What are you waiting for?". NOW is the time to expand your toolbox! 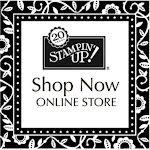 For the entire month of May, join Stampin' Up! 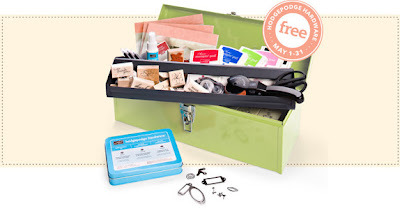 as a demonstrator and get 20% off the Starter Kit, PLUS a free tin of Hodgepodge Hardware (p. 188) from the Spring-Summer Collection 2008 (a $27.95 value!). The Starter Kit (p. 209) comes complete with all the tools you'll need to start a successful business--$359 worth of stamping and business supplies for only $159! Construct your kit by selecting the nuts and bolts of your stamping supplies, and take your toolbox to the next level! Contact me today ... nrileycm@cox.net ... to get 20% off the Starter Kit and FREE Hodgepodge Hardware! It's time for Joanne's What You've Got Challenge! 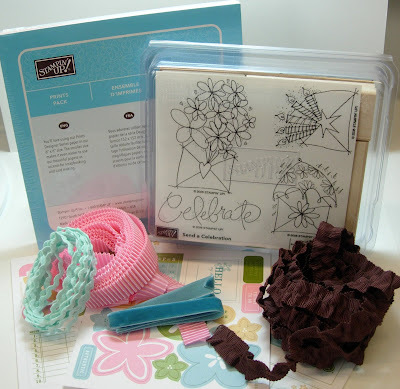 This month's challenge is to create something using Stampin' Up! 's Berry Bliss Designer Series Papers, using at least THREE different prints from the pack! Joanne's also giving away a prize! I hope you'll play along! See all the challenge details .... HERE! on Joanne's blog, ...just a little something... . Check out more samples from my friend, Dawn Easton, Treasure Oiler Designz. 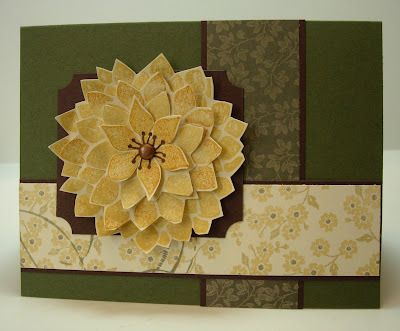 I used Beate John's tri-fold pocket card tutorial (again!) to create my first sample for May's WYG Challenge. The three prints from Berry Bliss that I used include a) the body of the pocket, b) the belly band, c) the circle pull for the insert, and d) I'm going to count the inside of the pocket since the opposite side is visible. 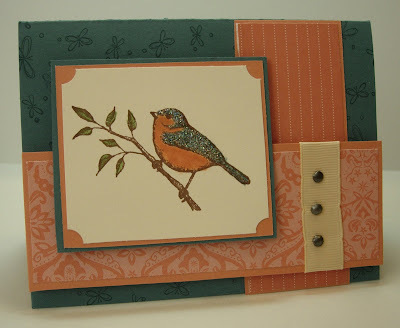 I just love these tri-fold pocket cards ... they are EASY! This next WYG Challenge Card was inspired by Julee Tilman's Mojo Monday 36 Sketch but took a slightly different turn on the center panel. 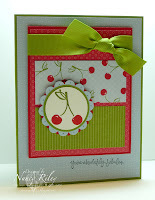 The background uses two Berry Bliss prints, and the sentiment is stamped directly on the third Berry Bliss print. Edited To Add: Miss one! There's a fourth Berry Bliss print used on this card - the Pretty In Pink piece that the ribbon is tied around and backs the Flower Fusions. 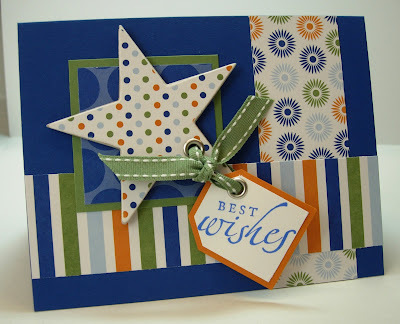 This card showed up on Stamper's Showcase this morning! 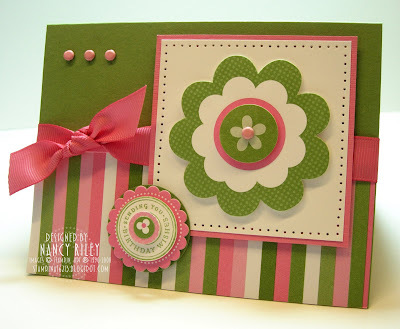 If you don't know what Stamper's Showcase is, it is a gallery on the Stampin' Up! 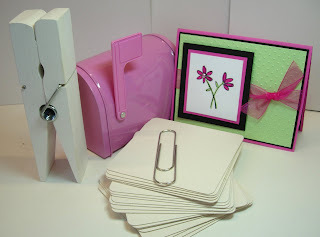 Demonstrator Website that displays cards and projects made by Stampin' Up! Demonstrators. See all the details about this card HERE in this previous post. 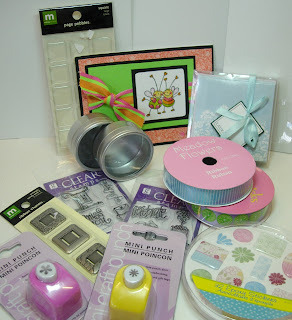 This next assortment of alterable goodies is blog candy that I won on Martha Cavasos Fipps' blog, Bloomin', Cookin' & Stampin' Where I Am Planted. I even had the pleasure of talking to Martha on the phone after this package arrived! We could have talked forever! She is so FUN! This is not stamping related, but some of you left comments on THIS POST asking if I was going to show the photo frame that Allie gave me for Mother's Day, and asking what Drew gave me that evening. 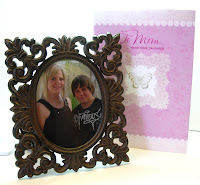 This photo shows the photo frame and beautiful card from Allie. The words inside the card are AWESOME !!!! LOVE that photo frame! The girl's got taste! John took this snapshot of Allie (16) and Drew (13) before the Band Banquet Friday night, and Allie had it in the frame when I opened the gift! A Holiday memory with mom ... I remember that every year, you would always ask Allie and I to put the decorations up on the tree, and you always go and rearrange the decorations. Leave it to my kids to point out their self-diagnosis of my OCD every chance they get!!! LOL! My mom is happiest when ... You are happiest when you are stamping. He hit the nail on the head with that one! Mother's Day evening, we grilled out and had dinner on the patio. In the middle of dinner, Drew says, "Well, since it's Mother's Day, I have a big announcement to make." I sat there stunned over the mature, formal nature he used to tell us that he has a new girlfriend. Too funny! I love Drew's sense of humor!!! I have been busy stamping, but can't show you any of the projects I've been working on ... yet. Thanks for stopping in! Let me tell ya' what a blast I had reading all your iCANDY comments, and learning more about my readers! I can't WAIT to address some of your questions this week! THANKS to everyone who participated, and an even bigger THANK YOU to those of you who went so far as to link my iCANDY for a second chance at winning! emily said ...Congratulations on the hits Nancy! I've been stamping about 2 years (I think), and I've been a demo a little over a year. And I've definitely have been to your blog before =). It's one of my favorites! 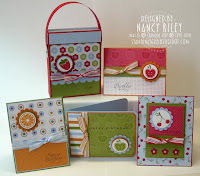 Please visit Emily's blog, Stamping Expressions. HAPPY MOTHER'S DAY to all mothers out there! Hope you're able to get a little pampering in for yourself today! I'm doing exactly what I want to be doing ... STAMPING (in my jammies!)! It's been an extremely busy week, and I haven't stamped a single thing all week! In fact you'll be able to see by the looks of this card that I haven't stamped all week! ... let's call it my warm-up card! 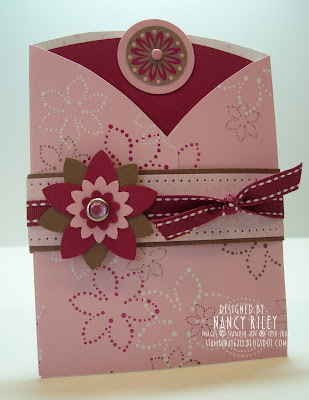 It cases THIS CARD by Jennifer Meyer, lovetostamp6 for SCS Featured Stamper Challenge #66. Jennifer's blog, Jennifer's Sweet Designs, is so appropriately named because her designs are truly sa-weet! (and she is too!) In my humble opinion, Jennifer has a wonderful way of working with soft, pastel colors and her style is feminine and romantic. Her gorgeous gallery can be found HERE. Things I changed from Jennifer's original include: a) I used Rose Red instead of Soft Sky for the monochromatic color scheme, b) I used the Swiss Dots Cuttlebug Embossing Folder instead of Textile Texture, c) I used three half-back pearls on the right side instead of a Prima Flower, d) my scallop border was created using the slit punch versus the corner rounder punch, e) I didn't use ribbon. There's a little secret behind my card ... I have never invested in the Stampin' Up! Pretties Kit! *gasp* I'm hoping to earn it for free with my demonstrator rewards points because I truly do love it! My half-back pearls were found at my local Michael's store, and they are from the Martha Stewart Crafts line. I just want to take a Mother's Day moment to brag about my kiddos, and as always will try to keep it short and brief. First of all, Allie was pleasantly surprised to receive a special award at her Band Banquet Friday night ... Section Leader of the Year !!! The look on her face when her band director called out her name was just priceless ... I'll never forget it! I'm so stinkin' proud of her! She surprised me this morning with a gorgeous photo frame, and in it was a picture of her and Drew! I've always told my kids ... "don't spend money on gifts for me just for the sake of buying a gift"! The way I look at it is there's never enough money to go around to pay for all the stuff we NEED, let alone going out and buying things we don't NEED! Allie took it upon herself to spend HER hard earned money on my gift this year. It, along with her beautiful card, sent me to tears this morning! Drew is on a road trip to Sedona with his friend, Alex and his family for the day. On the phone, this morning, he said I could go get my present out of his backpack if I wanted. LOL! I told him I'd wait until he got home this evening. Drew could do without all the mushy stuff! One more thing .... there's still time to enter to win the iCANDY in the previous post! As of this writing, there are 237 entries! WOW! My inbox is goin' CRAZY!!! I have quickly read each and every one over the past couple of days, and look forward to reading them in great detail over the coming week! It's been fun reading about YOUR stamping background, and am thrilled with the questions you've come up with for me! I'll be selecting a winner Monday morning (5/12). 1) How long have you been stamping? 2) Are you a Stampin' Up! Demonstrator? 3) Have you been to my blog before? 4) Feel free to ask me any stamping related question you like! I'd love to do a Q & A post next week with your questions! Also ... mention my iCANDY on YOUR blog with a link to this post, then link it back to here in an additional comment for a second chance at winning! 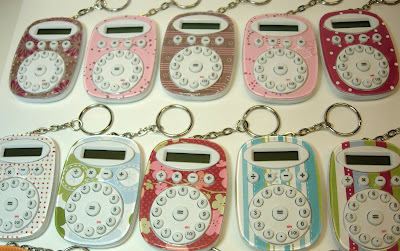 Lorri Heiling and I altered these 99 cent calculators with a variety of Stampin' Up! designer papers for the members of our weSTAMP Demonstrator Group at our last meeting. 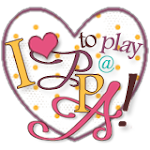 I THINK I cased this idea from Patty Bennett ... couldn't find it on her blog, Patty's Stampin' Spot ... I've got an e-mail into her to confirm that she was the one I cased ... will follow up on that asap!). 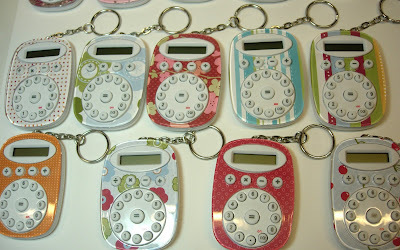 Edited to Add: You can also see these keychain calculators on Dawn Griffith's blog, Dawn's Stamping Thoughts. 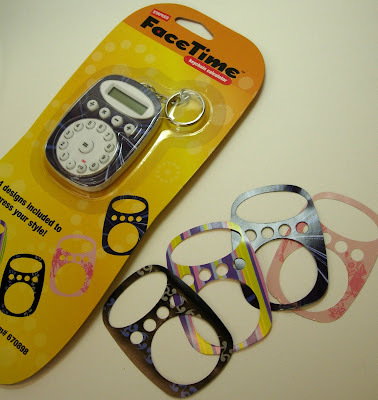 They are Staples brand FaceTime keychain calculators, sold for 99 cents at Staples Office Supplies Stores. The acrylic faceplate pops off and there are 2 double-sided faceplates that come with the calculators. If you're a stamper, you don't need the faceplates that come with the calculator, you will want to use this calculator keychain to show off Stampin' Up! Designer Papers, of course! Here's how it's done .... trace the manufacturer's faceplate onto the opposite side of Stampin' Up! Designer Paper, cut out with scissors. Use the following Stampin' Up! punches for the holes in the designer paper faceplate: 1 3/8" Circle Punch, Small Oval Punch, and 1/4" Circle Punch. Edited to Add: I found that the Small Oval Punch was slightly smaller than the oval hole for the calculator. After punching it once, I just readjusted and punched again to make the hole slightly larger in order to fit on the calculator. The following photos show the variety of different Stampin' Up! Designer Papers we used to customize the calculator keychains for our group members. The possibilities are endless! Just had to include this photo of my dog, Millie. She's 9 years old, acts like she's 14 years old, and overweight (gol' ... kind of sounds like her owner!) 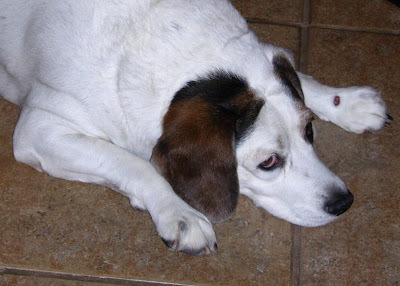 ... but I love my beagle girl! She looks at me with this sad face all day long! I'm working on that iCANDY I promised a few days ago in celebration of 200,000 hits. Hope to get it posted on Thursday! Tonight was my Tart & Tangy Summer Picnic Gift Set class (details in THIS POS T). Here's what I surprised each participant with ... water bottle tags with individual Crystal Light packets. 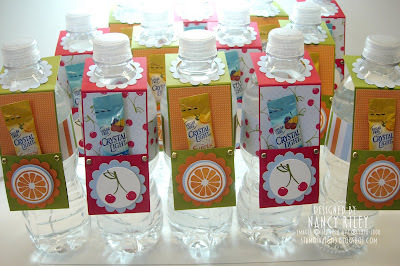 I decorated them with the Tart & Tangy stamp set and Summer Picnic DP, coordinating with our class project! Our snack for the evening ... fresh fruit, of course! (served with this easy and delicious fruit dip). It was quite fun for me to have a theme for my class! Notes: Water Bottle Tag measures 2" x 7 3/4", and scored at 2" and 6". Coordinating DP is wrapped around the water bottle to cover up the brand label. The Crystal Light packet flavors I used are Classic Orange and Fruit Punch. I know what you're thinking ... there she goes again using that Crew Kids Girl Simply Scrappin' Kit to make another EASY card! My response .... SURE AM !!! As I've said before, the color combination of Pretty In Pink, Regal Rose, and Wild Wasabi has GOT to be one of my all-time favorites! Seems like every time I have a break from stamping for a few days, I tend to go for this SSK to get me back in the groove of designing. 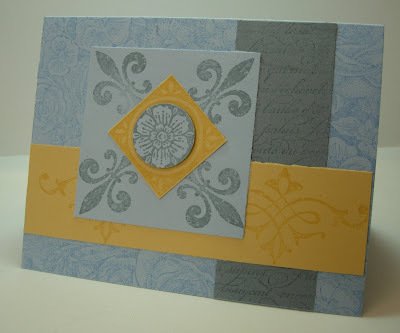 The only stamping on this card i s the sentiment from Circle of Friendship, "Sending You Birthday Wishes". 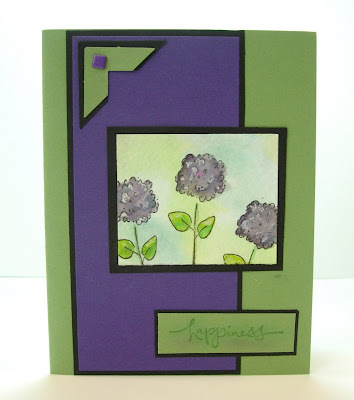 The main image flower and the layering on the sentiment piece are self-adhesive die cuts from the Crew Kids Girl SSK. 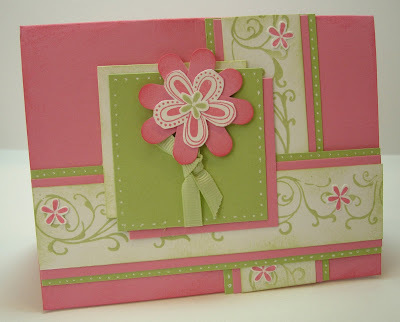 To create this card, I used Jessica Rone's sketch for Great Swaps Girls (GSGC02) and Sharon Johnson's Stamp Simply Challenge #33 (SSNOTIME33) which was to create a simple card using pink and green and a flower. Lots of fun mail to share with you today! It's a good thing I've got wonderful friends sending me wonderful stuff, or I wouldn't have anything to share. I'm busy cutting CS for my Tart & Tangy class. There have been so many neat challenges this week ... it's killin' me that I don't have time to play along! 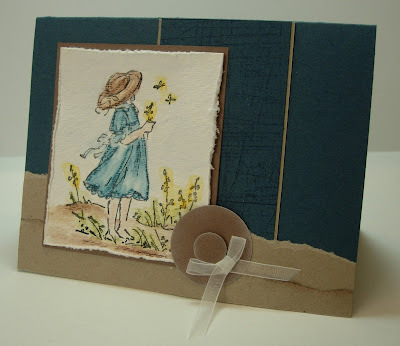 This first beautiful card is from the newest member of my Stampin' Up! Creative Team, Mauna Kirkham, Ink~Paper~Scissors. Mauna has some blog candy to give away HERE in celebration of 6 months cancer free! A special celebration, indeed! 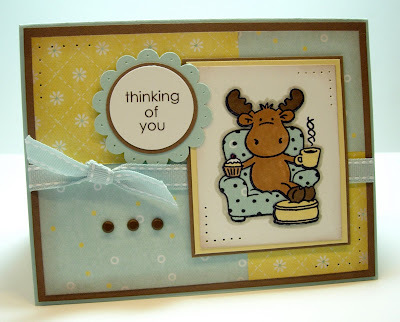 This next super duper cute card is from my friend Wendy, joelysmom on SCS. I like this little moose .. his name is Riley! This next photo shows the blog candy that I won on Lori Barnett's blog, Stamp Scents. Lori included some hand crochet flowers, some stamped Penny Black Zoophabet images, and a Gold Canyon Candles bookmark and auto freshener. Lori sells Gold Canyon Candles and is a Stampin' Up! Demo! btw ... my counter hit 200,000 last night! After I get Monday night's class out of the way, I'll get some iCANDY together for you!